Iron Maiden, Slipknot, Joe Satriani, Slayer, Zakk Wylde, and a host of other stars turned out to celebrate the 50th birthday of Marshall Amps on Saturday. 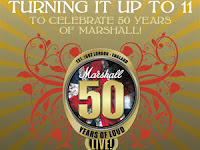 Rockers including guitarists Kerry King, Zakk Wylde, Yngwie Malmsteem and Joe Satriani, drummers Mike Portnoy and Nicko McBrain and singers Corey Taylor and Tim 'Ripper' Owens teamed up to give special performances of iconic tracks for the Marshall 50 Years of Loud concert at Wembley Arena in London. 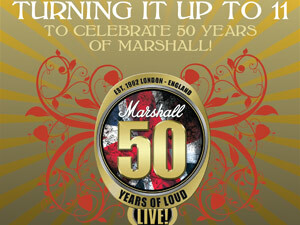 They also paid tribute to Dr. Jim Marshall, who founded the amplification company, who sadly passed away in April. Iron Maiden drummer Nicko told the crowd: "What an honour it is to be here on this wonderful, iconic brand's 50th birthday. It has mixed emotions for me, as Doctor Jim Marshall was a very good friend of mine, and as you know we lost a remarkable man earlier this year. "We all thought he was going to be here to listen to this wonderful music - which he loved, by the way. He loved rock 'n' roll. "Music is life and he certainly brought it to life with the amplifiers he came up with." Songs included Thin Lizzy's Still In Love With You, and Ace of Spades by Motorhead guitarist Phil Campbell with Corey and the house band. Kerry King and the Slipknot man teamed up for Pantera's Mouth for War, before Ripper joined to take on Judas Priest's Hell Bent for Leather. Later Swedish virtuoso Yngwie Malmsteem brought serious showmanship to his set, playing his guitar with his teeth, flipping it from side to side and performing blazing solos. Speaking about the amplifier brand, he earlier told BANG Showbiz: "I have a very special relationship with Marshall, I got my first when I was ten, and I've always had huge stacks of them. "To this day there is a saying that there are two man-made objects that can be seen from space - the Great Wall of China and Yngwie Malmsteen's Marshall stacks." Toward the end of the night another virtuoso, Joe Satriani, performed three tracks, including Always With Me Always With You, which he dedicated to Jim. The show then culminated with all the night's performers onstage for a rendition of Deep Purple classic Smoke on the Water. Must of been a hell of a night in heaven! Great show and musicianship! Long live marshall!